This is very important! If you do not have an adequate emergency fund when life happens to you, you will feel defeated. It has a very negative impact on your desire to budget when you have to reorganize EVERYTHING to pay for emergencies. If you have an emergency fund all you have to do is cover the emergency without reorganizing the entire budget. The friction caused by disagreement will often cause the budget to be a flop before it ever has a chance. Be sure to compromise in order to reach your goals. It is important to remember that it is better to lose a battle in order to win the war. If you push your spouse away from agreeing on a plan then you will never have the traction needed to win with money. You are on the same team and both of you have different roles in the process. Handling the money is not for one or the other to deal with alone, it is a joint effort. Huddle up and agree on your goals, values, and dreams together! Furthermore, you should check out the movie Fireproof with your spouse. It is a real eye opener and may just help you handle disagreements with love as opposed to anger and frustration. It is not just for troubled couples, it is for everyone. How well do you love your spouse? Find out! It is so easy for us to ignore what we waste money on. Probably because the things that are causing our money to vanish are due to things that we don’t really NEED but really, really WANT! There is a difference you know. Try this. Take out a piece of paper and start two columns- one for NEEDS, and the other for WANTS. After budgeting your four walls, take everything else and place it one of the two categories in order of priority. Next, budget the NEEDS until there are no more. (Credit Cards aren’t considered needs but you should certainly pay all minimums on all your bills before buying that speed boat you have always wanted.) Then if you have any money left over, budget your WANTS in order of priority. It is called personal finance for a reason so whatever you decide is fine. However, if you are on a Total Money Makeover, your gazelle intensity will determine how long you remain in debt. Is getting out of debt a NEED in your life, or just a WANT? Your budget will show you the truth. Don’t forget to think about any irregular expenses you may have for the following month when you are doing your budget. It can kill your motivation if you do your budget only to realize that you forgot to account for the auto insurance that renews this month. Don’t forget about Christmas, birthdays, special trips or anything that can throw your budget out of whack. 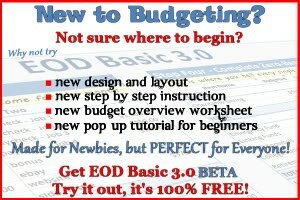 If you use my FREE EOD Basic Budget 3.0 for your budgeting needs, I have inserted a place to plug in these irregular expenses so you don’t forget. There is also a savings worksheet to help you keep track of how much you should be saving each month to cover those expenses when they come due. This happens to be one of my favorite things to use to ensure a happy budget. By using an envelope system for all cash expenses, you will save lots of money. How? Well that is easy! When you purchase something using plastic it does not register as pain, whereas when you use cash you are much more likely to feel the loss. This causes you to ask yourself more honestly whether or not you really need something. Give the envelope system a try and see for yourself. Start off slow by starting a couple envelopes at a time, like groceries and fuel. Remember, you will never overspend if all you have is $50, but when you use the debit card it is very easy to say, “It’s only a few dollars extra”. That is not spending with a plan which is what the budget is in the first place. Don’t nickel and dime your budget to death by not following your plan. A death by 1000 cuts is still a death! This may be one of the biggest tips to maintaining a healthy budget. Resolve to stop borrowing money today, and use cash to buy the things you want. Use the good old fashion method of saving for the stuff you want instead of borrowing. Stop paying more for everything you buy by putting them on credit cards. If you can’t pay cash you can’t afford whatever it is. Dump your debt in order to win with money. 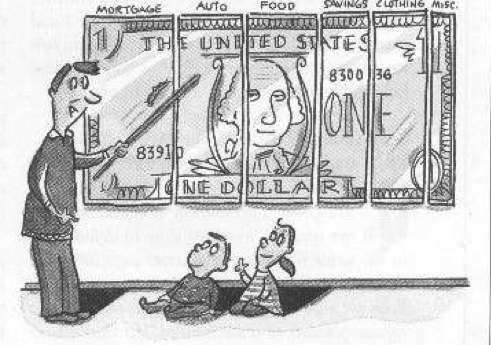 Being slave to the lender is no way to live! Keep higher standards for you and your family and the benefits will amaze you! I loved tip #2! That is hilarious because spouses are often NOT on the same page. I have that problem with my bf. He doesn’t see debt as a bad thing but I do. He has no problems with creditors calling him but when the doctor called me about a $5 copay that they had undercharged me I nearly pitched a fit. It would be great if we were able to all get it together at the same time, but sometimes it doesn’t work out that way. I guess it takes one person to realize where they would like to be in the future and hope the other person comes to that point eventually. I just made a blog post based on #2 here. Thanks for the inspiration. Trackback added to this page. Sandy´s last blog post..Are You & Your Spouse Are On The Same Team? I agree on all points and #2 in my mind is definitely the most important if you have a spouse. A budget WILL NOT work without communication, commitment, and compromise. You cannot do this alone when there are two people, it simply doesn’t work. After you have the $1,000 in place it is important to utilize the envelope system, we have and it is a godsend. It is so much easier to know where our money is, where it is going and I actually feel good about letting the money go. Well…it beats using a debit card over a weekend, tallying up all the little “gotchas,” not having enough to pay bills and then using a credit card to pay for the shortfall in money. Thanks Mr. Plasectomy, Sandy, and Jason!! I am so glad you enjoyed this post. The thing is that so many people call into the Dave Ramsey Show and claim that one or the other handles the money. I know from experience that this is not the way. First my wife handled the money, that was until we had one to many money fights. She finally said FINE, you do it. I tried with the same results excet for I was the one in the hot seat. LOL Being on the same team eliminates the blame game completely. It is real hard to have a money fight if you both agree beforehand on how to spend the monthly income. It works like a charm!! Thanks for reading and I hope to continue providing quality posts that you will enjoy! Oh yeah, sorry it took me so long to get back ovver here to thank you all! I really do appreciate my readers very much!! I can totally emphasize with you on the money fights. I used to handle all the money and there would be fights as to why there was never enough and then I did the same as your wife did to you, YOU DO IT! That was disastrous; late payments, fees, juggling the paychecks to pay bills, etc. When we finally got on board with one another our relationship with money became MUCH smoother. Mr Plasectomy´s last blog post..Plasectomy Fitness, Why Is It So Hard To Get In Shape? Brad, #3 – at the end, your comment on the tithe is probably the most important thing to do first, in all efforts to budget. The Bible says, “Give careful thought to your ways. You have planted much, but have harvested little. You eat, but never have enough. You drink, but never have your fill. You put on clothes, but are not warm. You earn wages, only to put them in a purse with holes in it.” He gave all . . . and even when we give a little 10% we still keep 90%. When we give first . . . somehow all needs are met, because we give, trusting that He will take really good care of us, as promised in the Bible. Thanks Brad! Hi Reta! Thanks for stopping by and thanks for the insight you brought along! The Bible is the best text book indeed!